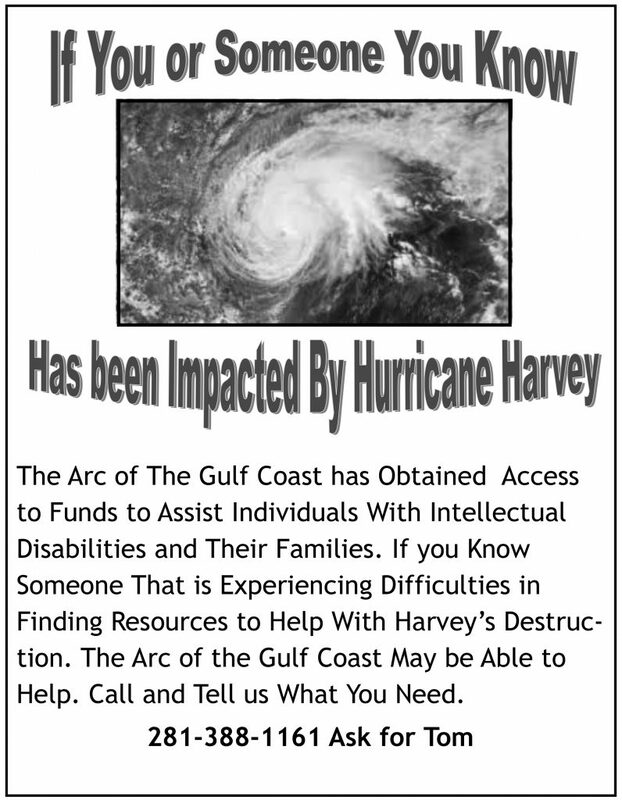 We at The Arc of the Gulf Coast would like to let everyone know that we are here for our families during this time. Please view the resources below if you are in need of assistance and/or contact us if we can help in any way. 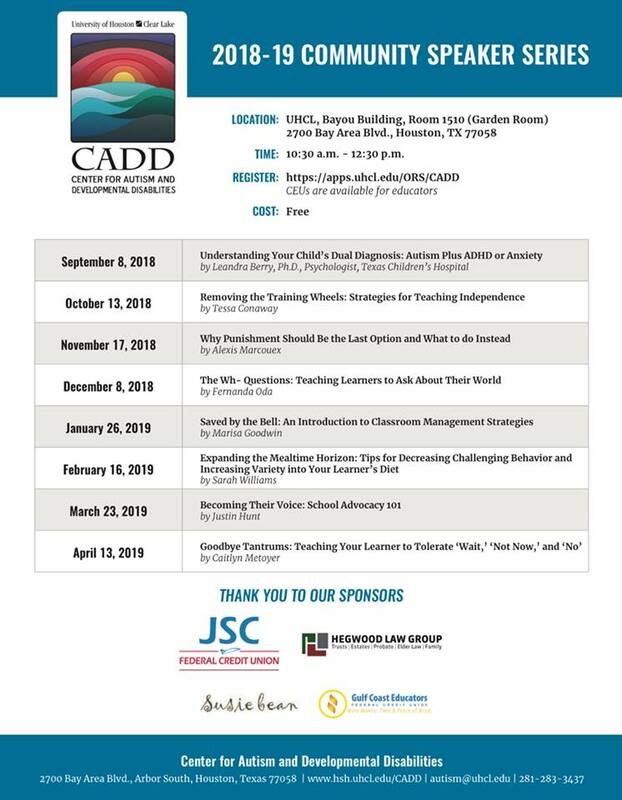 For a more extensive list of resources visit the Main Arc of Texas Website. You will be asked for a Disaster Relief (DR) number which is 4332 for Hurricane Harvey in Texas. Assistance is now available for people with critical medical needs in the amount of $500/family. If you are in need of shelter, please contact the American Red Cross. Available across the state of Texas. Please call 2-1-1 if you are homebound and need food and water. If you have access to the internet, you can go to United Way 211 website and look up organizations that can help. Note: This is not an emergency number. 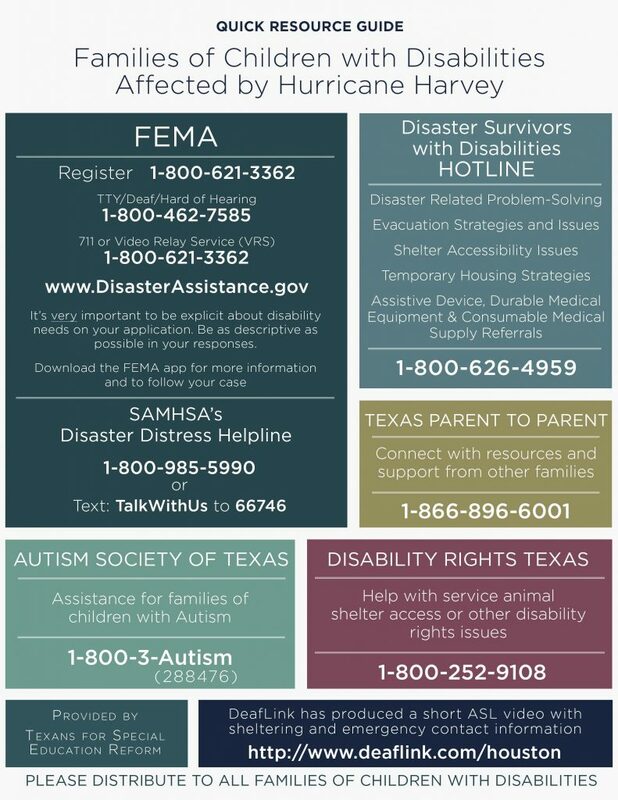 The Autism Society of Texas can assist with shelter sensory rooms, shelter behavioral supports, sensory support kits, limited financial resources for autism families to replace lost items or sensory supports. Contact Suzanne Potts at the email above. Text “talkwithus” to 66746 or text “Hablamos” to 66746 for a Spanish-speaking counselor. Provides counseling and support before, during and after disasters and refer people to local disaster-related resources for follow-up care and support. The Disaster Relief program supplies those affected by natural disasters in Texas with diapers-the only organization in Texas specifically providing victims diapers. TXDB collaborates with partner agencies who coordinate and provide relief services to communities affected by natural disaster. If you were impacted by Hurricane Harvey and need medical supplies, fill out online form. Cannot guarantee that your request will be fulfilled, however every effort will be made to do so and/or connect you with someone who can. You can also contact Trach Mommas: 504-723-7193 for Pediatric Medical Supplies. To support displaced families throughout Texas, Uber is donating free rides to or from shelters (up to $50 each) within Houston. No action is required to receive a free ride to or from these locations. The full discount will automatically be applied and reflected in the app when you request UberX. If you lost your job because of Hurricane Harvey, you can apply for unemployment benefits online call the number above.